As the Canadian federal election campaign reached its final three weeks, the CBC, perhaps hoping to give readers a brief respite from what as been the longest campaign since the nineteenth century, published an article about the preferred coffee stops of the three major parties’ leaders. Conservative leader and incumbent Prime Minister Stephen Harper, we learn, is always keen to make campaign stops in a Tim Hortons, while the New Democratic Party’s Tom Mulcair seems to prefer Starbucks. There are photo-ops a plenty to attest to each man’s apparent preference. A curious outlier, on the other hand, is Liberal Leader Justin Trudeau, who admitted some months ago that he doesn’t drink coffee at all (an admission, he joked, that was more likely to alienate voters than his earlier statement about having smoked pot). While, in itself, the CBC article is little more than some late election fluff, it speaks to some long-standing practices in political campaigning about the role of food and drink. The three ways in which eating and drinking play a role in the political campaign are as an enabler of activities, a symbol of identity, and as an aesthetic prop that can either bolster or undermine a candidate’s public image. The most obvious role that food plays in a campaign, of course, is feeding people. Candidates and their staff need sustenance, and so do their supporters on the campaign trail. There’s a clear reason why politicians stop at coffee shops, which is that their schedules require a good deal of caffeine. Even Mr. Trudeau, with his freakish ability to maintain his campaign schedule without coffee, needs to eat. Stopping for food as a campaign stop also provides would-be leaders with an opportunity to meet the voters in an unassuming, natural way by eating with them. And, unsurprisingly, there is a long history of food and drink being used to enable political events and provide a suitable backdrop for them. In a sense, food-and-drink-centred events for political supporters of today, whether fundraising dinners or cocktails, candidates’ pub nights, or summer barbecues, appeal to the same sense of hospitality and sociability that leaders have used for centuries to shore up the loyalty of their supporters. The use of a meal in this fashion is positively antique: one might consider the mythical mead hall of King Hrothgar in the epic Beowulf. Or, if one prefers one’s examples to be more true to life, Edward I’s “Feast of the Swans” in 1306, which provided a chivalric celebration for the English king to rally his knights against the Scots. I could likewise cite countless state dinners and banquets that played similar roles. In electoral politics, Hanoverian Britain is probably an ideal spot to begin talking about food for voters (or rather, as we shall see, food for votes). While many of the parliamentary elections of the eighteenth century in Britain were only nominally competitive, with the majority of seats almost by default going to the governing Whigs, they were no less public events for it. A candidate, once chosen, had some responsibility to ensure the loyalty of his electors, which in most seats meant a fairly closed-circle of men with property. While a candidate usually owed his position to a local benefactor or patron, and ultimately to the Whig’s intricate system of party patronage (largely developed and controlled by the man at the head of the party from 1720-42, Sir Robert Walpole), he needed to maintain his constituents’ support as well. That was done in large part by “treating” the electors, which is to say providing them with food and drink at suppers, rallies, and balls. The largest expenditure for a candidate would be such “treating”, and the cost could be prohibitive. If this practice sounds suspiciously like bribery to you, rest assured you are not alone in this, and the Whig’s practices received their share of satirical opprobrium from their contemporaries. 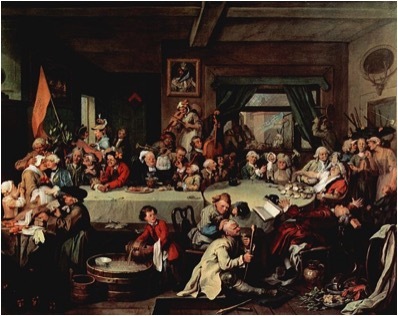 An excellent example is William Hogarth’s The Humours of an Election, a series of illustrations about a county election in 1754, which included An Election Entertainment. The “entertainment” in question is a debauched scene in which the Whig candidates wine and dine their supporters. Though treating of electors was regarded by some as an example of Whig corruption, it continued as a practice in Britain into the nineteenth century. The practice was exported, along with British democratic institutions, into North America, where the Virginia House of Burgesses saw elections typified by candidates “swilling the planters with bumbo”, that is to say, feeding copious amounts of alcohol to their neighbours and having them vote them into office. This was presumably the practice of most if not all of the successful candidates for office, including such young men as George Washington and Thomas Jefferson. Feeding food and drink to voters to win them over is now generally frowned upon in most democracies, but the appeal of eating and drinking with the candidates, with its convivial atmosphere and sense of special access, is still drawn upon considerably in the fundraising circuits. If eating and drinking might provide an effective backdrop for other activities, the consumption of particular foods might also come with poignant political symbolism. In Canadian politics, the Conservative party has made no secret of its desire to appeal to the “Tim Hortons voter”. Given the restaurant-chain’s relentless marketing as being the most Canadian of brands (various periods of foreign ownership notwithstanding), a place where the average Canadian parent goes to pick up an average Canadian coffee on the way to their average Canadian child’s hockey game, the symbolism of this preference hardly needs to be explained. The “Starbucks voter”, if that is even a term, hardly comes with the same sense of patriotic symbolism. Other foods and drinks have all too often had a sense of national identity attached to them as well. For England in the nineteenth century, it was beef that had a particularly English characteristic, and was claimed to be the reason for England’s wartime victories over the presumably-less-beef-fed French. Leading up to the first world war, hostilities with Germany were exhibited also in English attitudes towards the unsavoury and suspicious contents of German sausages. And of course, for American GIs in the twentieth century, they were fighting for “Mom and apple pie” (or so the popular accounts tell us). When food and drink have such symbolism, it’s not surprising that they are sometimes taken advantage of for their political effect. While I know of no examples of English politicians using roast beef as an electoral rallying cry, there is a fine example of drink as political totem in the United States. The 1840 presidential campaign of William Henry Harrison came with the effective use of hard cider. As regular readers of the Historical Cooking Project might recall, hard cider had been the drink of choice for colonists since the seventeenth century, and remained so until it was supplanted in the late nineteenth century due to urbanization, temperance, and the growing beer breweries that came with German immigration. In the 1840s, hard cider was still the preferred drink of most, and Harrison was the “hard cider and log cabin” candidate, representative of the common man and the spirit of Western expansion. Those symbols were synonymous with his campaign. 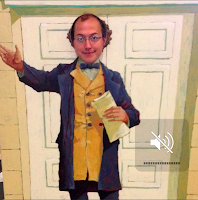 By contrast, the Democratic incumbent Martin Van Buren was easily cast as elitist and out of touch. If only he’d been seen drinking cider more frequently! Another canny symbolic use of food politically does not come from a campaign at all, but I can’t help but include it. 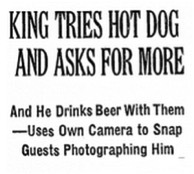 In 1939, another American President, Franklin D. Roosevelt, put on display that most American of foods, the hot dog. The occasion was the state visit of King George VI and Queen Elizabeth, in the midst of their royal tour in Canada. The purpose of the visit was in large part to make the American public more sympathetic to the cause of the United Kingdom as war with Germany seemed imminent. Roosevelt reportedly wanted to ensure that the royal couple were presented in the most “democratic” light possible, and what better way than by having them have a meal of hot dogs at the president’s private retreat in Hyde Park? The king even ate his hot dog with his hands: just like an American! The manoeuver seems to have been successful, and the royal visit was well received in the American press. Food’s symbolic importance, as indicated by the King’s choice of how to eat his hotdog, can be very much an extension of the person eating it and the manner in which they do so. And there have been some recent stories in British politics concerning how part leaders eat: on the one hand, Labour’s former leader Ed Miliband entered the General Election campaign with many observers asking whether he was just too “weird” to win, fuelled at least in part by an unfortunate photograph of him eating a bacon sandwich. On the other hand Prime Minister David Cameron met with similar response when he was seen eating a hot dog with a fork and knife, a gaff that even George VI had managed to avoid. And finally, one cannot speak about food related campaign mishaps without citing John Kerry’s 2003 run in with a Philly Cheesesteak. Not only did Kerry order the wrong kind of cheese (Swiss, rather than Whiz), but he was photographed holding the sandwich in an awkward fashion and taking a bite that can be described as cautious at best. What all these events did was to confirm something that the voting public already thought about the candidates in question: they’re all just a bit out of touch. Miliband had often been considered a bit awkward, a bit ill at ease with the public, and the sandwich picture simply sealed the deal. Cameron, privileged old Etonian that he is, has struggled to shake off an image of upper class neglect of the ordinary Briton. And Kerry likewise had to fight an uphill battle against the sense that he was elitist. The fact that neither man ate their altogether plebeian meals in the way an “ordinary” person would proved to be rather awkward for both. These electoral missteps notwithstanding, food preferences can also be drawn upon to bolster a candidate. And no politician’s diet more successfully complimented his personal and political image than Labour’s Harold Wilson. 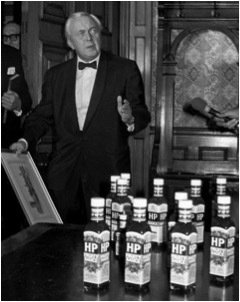 Wilson, UK prime minister from 1964-70 and again from 1974-76, was almost synonymous with his preferred condiment. Wilson’s wife, Mary, cited his tendency to “drown everything with HP Sauce”, and his fondness for it led some to popularly refer to HP Sauce as “Wilson’s Gravy”. That Wilson drenched his sausages and mashed potatoes in Britain’s most popular vinegar-based brown sauce said something about his plain tastes, and did a good deal to prop up his popular image as an ordinary bloke. He didn’t eat fancy foods, and he reportedly didn’t even much like to travel. Altogether, Wilson came across as relatable and that did a great deal to help him on the campaign trail, where he beat the Tories in three out of four general elections. More recently, UKIP leader Nigel Farage has taken a similar tact, and has been none too subtle in his attempts to use a pint of beer to illustrate that he has more in common with the average voter than do the usual Westminster crowd. In this he’s something of a successor to Wilson, though his electoral fortunes have been considerably less impressive. In terms of image, Canadians have a few days yet before we see whether the “Tim Hortons voters” turn out to keep Mr. Harper in office. For Mr. Mulcair, flagging in the polls, his Starbucks meet and greets seem not to have managed to rally the electors sufficiently. And as for Mr. Trudeau, who seems to have the wind in his sails during the campaign’s final week, the lack of coffee hasn’t dampened his energy, or, more importantly, his standing in the polls. All in all, while I doubt that coffee shops will play an important role in the outcome of the election, it’s all food for thought. Justin Irwin is a PhD candidate in the Department of History and Classical Studies as McGill University. His dissertation is about religious identity among London-area Baptists in the seventeenth century, and his research in fact has nothing in particular to do with food.